Mass-publishing advertorials and paying for links or used to be an effective way to build up a website’s link profile, but Google has become more critical about link quality and quantity. Earlier this year, they penalized Interfloral, a popular floral website in the UK, for buying a massive amount of advertorial and blog post links over the years. According to a case study created by Link Research Tools, 70% of Interflora’s links were “Suspicious” or “Toxic”. The penalty affected their website’s search visibility, keyword rankings, and website traffic so severely that many SEOs and webmasters were surprised to see how quickly they recovered their rankings. Their pages started reappearing in Google’s search engine results pages just 11 days after being penalized. This chart shows how badly the penalty affected Interflora’s search visibility. His “general” answer offers a simple solution to anyone who received a penalty for suspicious links built over a period of time: mass disavows. Cutts has always advocated the bold use of the disavow tool, advising webmasters on his own blog to use it like a machete instead of a fine-toothed comb. A few weeks ago, he even advised webmasters to go ahead and disavow suspicious links, even if they haven’t received a penalty for them yet. Instead of sending reconsideration requests where you’ve only pruned a few of your suspicious links, Cutts recommends disavowing entire domains with bad links. If your company paid for massive link building schemes over a certain time frame, Cutts suggests disavowing all the links built for that particular period. If you’ve received a penalty for building bad links over the years, or if you want to clean up your backlink profile even before Google penalizes your website, our advanced SEO services may be just what you need. 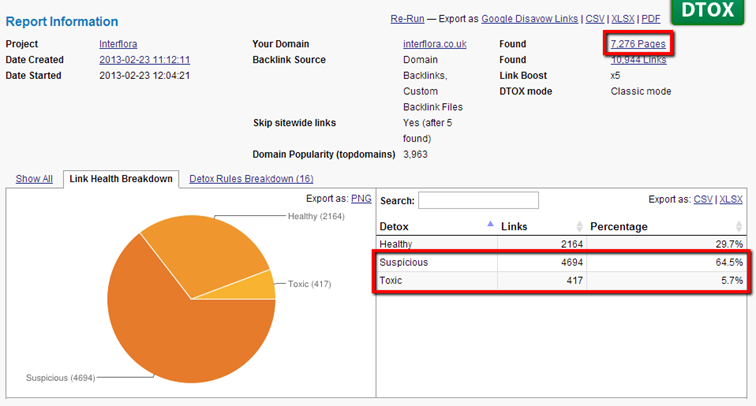 We can assess your current link profile, identify any toxic links, and disavow them for you. Contact us to get your free website audit today!